Dr. Henry has successfully treated these conditions for over 20 years. Call 361-576-2111 to have relief from your painful condition! Your little toes help balance your body when you move. As your foot flattens, the little toes bend to grip the ground. Then they straighten, acting like levers to help your foot so you can walk, run, or dance. You may develop a problem known as a hammer toe. Hammer toes are little toes that buckle or curl under. Over time, these toes may hurt and make movement more difficult. But you don’t have to live with pain. With Dr. Henry’s help, even severe hammer toes can usually be treated so you can move more easily. Dr. Henry will examine all your toes, testing whether or not buckled joints can be moved. Your feet will also be checked for any skin changes. Corns (a buildup of dead skin cells) often form between curled toes or on top of buckled joints where shoes rub. If irritated, corns may turn into open wounds and become infected. If your symptoms are mild, changing shoes may be all the treatment you need. If your symptoms are severe, surgery may be needed. The type of procedure often depends on whether your toe joints are flexible or rigid. (often the bottom one) is cut and repositioned. A piece of bone may be removed to help straighten a rigid toe. Part of the contracted joint is cut away. The “gap” fills in fibrous tissue. 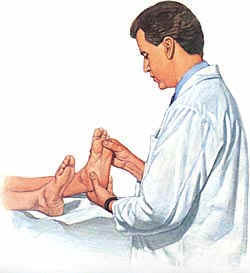 The toe heals in a straightened position. All hammer-toe surgeries are out-patient procedures. In fact, you will be able to bear weight on your foot by the time you go home. For best results, however, you may need to wear a surgical shoe for a few weeks. Your foot will be bandaged after surgery, and you may need to wear a surgical shoe to support the foot during healing. Dr. Henry may recommend a special dressing to limit swelling. Elevation and ice can also help. For best results, raise your foot above heart level and apply ice for 15 to 20 minutes. Protect your skin by placing a towel between the ice pack and your skin.